A dwelling exists to provide environments in which dwellers can conduct their various activities. To design an ideal dwelling, therefore, it is necessary to analyse these activities and then devise a set of conducive environments in which they may take place. I spend a long time observing my own activities within my own home. I also observe the activities of other members of my family. I notice that some activities demand little effort while others are very effort-consuming. This is generally because the latter are divided between different parts of the house. Had my house been design­ed differently, these activities would require only a fraction of the effort. A good example is washing clothes. Activities involving clothes are dressing on the one hand, and washing, drying and ironing on the other hand. Dressing normally takes place in the bedroom. Washing and ironing take place in the kitchen. Drying takes place outside in the garden. There is also another place where a dressing act­ivity takes place. That is in the hallway when putting on and taking off outdoor clothes and shoes. In winter, this is also done at the kitchen door when going to do things in the garden. The 4 environments involving clothes are separated by inconvenient distances. Dirty clothes have to be gathered from the bedrooms and carried downstairs to the kitchen, which is dominated by the totally unrelated activity of preparing food. Life would be a lot easier if I could wash, dry and iron my clothes close to where I wash, dress and groom my body. I listed all the activities that I observed and tried to arranged them in to some kind of order. They appeared conveniently to fall into groups of 3 closely coupled act­ivities. These groups are listed down the left side of the following table. Along the top of the table are listed a set of spaces or rooms. Each is designed to provide a conducive environment for a particular activity or group of activities. Not­withstanding, there is no 1 to 1 correspondence between an activity and its space. An activity may have one main home, but it may also take place to a lesser extent in other spaces. The correspondence between an activity and a space is not an exact matter. Thus, an activity's main space may be regarded merely as the centre of its most probable, most frequent or most intense occurrence. The background colours of a room name at the top of the table indicate the degree of privacy associated with that space. The Entrance Hall and Conference Room are considered "public" space. It is space that is effectively open to visitors of whatever origin: official, business, social, coterial or family. The Study/Office, Laboratory and Workshop are classified as "coterie" space. This is space that is open to members of my coterie. These include people with whom I am engaged in co-operative projects of various kinds. The Kitchen/Diner, Lounge/Cinema, Garden Patio, Kitchen Patio, Utility Room and Gymnasium are classified as "private" space. This space is restrict­ed to my family and friends. The Bedroom, Dressing/Laundry Room, Drying Patio and Quiet Patio are classified as "intimate" space. It is for use only by members of my nuclear family. The numbers in the body of the table show which activities generally take place in which spaces, and with what probability, frequency or intensity. The numbers 1, 2, 3 refer in sequence to the 3 activities shown on the same line at the left of the table. The rooms (or environments), shown across the top of the above table, need to be connected. People need to be able to move easily from one to another. Equally, however, these spaces need to be insulated from each other to some degree. People in one space doing one activity must not collaterally interfere with people doing something else in another space. For example, music, loud chatter or machin­ing in one space must not be permitted to disrupt people who are in deep thought, intricate discussions or sound asleep in other spaces. The adjacent table shows the degrees of connec­tion versus insulation that must exist between each pair of spaces. The first figure (1 to 5) is the deg­ree of connection need­ed. The second figure (1 to 5) is the degree of in­sulation required. These figures are partly object­ive and partly subjective: they are partly a physical need and partly my per­sonal preference. There are two main ways to insulate spaces from each other. Where two spaces do not need to be close, we can simply use distance. Organize the dwelling so that these two spaces are well separated from each other. Where two spaces must be insulated from each other but also close together, we must use appropriate mater­ials to provide the insulation. Notwithstanding, distance is by far the more effective insulator. Each space must be fully conducive to the activity it is designed to host. 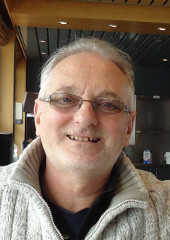 To be so, it must meet certain conditions and support certain services. For example, it must meet the conditions of adequate daylight, fresh air, warmth and acoustic ambience. It must also have adequate services like electricity and water. The following table shows which conditions and services each space must have to support the activity it hosts. In the case of "heating/cooling" in the above table, a "Y" signifies "Yes, it is installed in that room". The numbers that appear in the above table are interpreted by the table below. An "A" in the above table signifies that all the possible numbered options apply. In the adjacent table, Noise level 4: machines, includes both mechanical and acou­stic devices. The Air options are as follows: fresh signif­ies circulation, ventilation & conditioning; vacuum sign­ifies a vacuum point for a central vacuum cleaner; pr­essurized is air used for the operation of pneumatic de­vices such as sliding doors and cleaning-jets. The 115 volt 60 hertz electricity supply is universal for wall sockets in every room. The 12 volt 400 hertz supply is universal in every room for high-efficiency lighting. The 440 volt 60 hertz 3-phase supply is for high-powered motors such as in machine tools and new more efficient high-power domestic appliances. The 12 volt DC bus is the source from which all the others are derived. It is supplied from the dwelling's main storage battery. This is charged by solar, wind and green-diesel generators. Every space except the Quiet Patio has a built-in loudspeaker for "public address" and background music. The background music can be selected from within each room from a multiplex of channels. The selected programme can be interrupted by the public address announcement facility. It is suggested that the public address announcement facility be reserved for use only rarely in situations of great im­portance or emergency. A large number of rooms need an Ethernet data connection. Naturally, the comput­ers in the Study/Office need connection to the outside world. However, computers are also used in the Laboratory and Workshop to access information and to control experiments and machines. A computer is also useful in the Kitchen for recipes and in the Lounge/Cinema for displaying video files. A computer may also be useful in the Utilities Room and other places for accessing information. Ethernet service is preferably carried by fibre optic or co-axial cable. Wireless Ethernet is not preferred as it creates radiation that pollutes the electromagnetic environment. This could potentially interfere with sensitive RF (radio frequency) apparatus. Not mentioned in the above tables are the sensor services that are in each room and in strategic locations on the outer shell of the dwelling. The heating/cooling system for the dwelling makes use of a small artificial lake as a heat sink. All human activities, including those I have mentioned in detail above, fall into just three convenient categories. These can be loosely described as work, play and rest. They roughly correspond to the three main levels of privacy associated with human activities, namely: public, private and intimate. 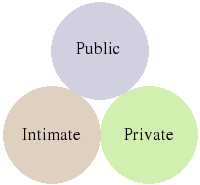 But I use four categories of privacy, namely: public, coterial, private and intimate. However, activities requiring the pub­lic and coterial levels of privacy can, without encumbrance, be conveniently collect­ed in what we can call the public class of activities. There are also what can be called private activities. These are activities one does alone, such as going to the toilet. These can be conveniently regarded as a distributed service that exists within each of the remaining 3 activity classes: public, private and intimate. I therefore group the dedicated spaces, in which these three classes of activity take place, into three separate environments. These I call my public, private and inti­mate environments. The Public Environment contains the Entrance Hall, Conference Room, Study, Office, Laboratory and Workshop. The Private Environment includes the Kitchen Diner, Lounge, Cinema, Garden Patio, Kitchen Patio and Utility Room. The Intimate En­vironment accommodates the Bedroom and Dressing Room, Laundry Room, Drying Patio, Quiet Patio and the Gymnasium. In the above tables, I classified The Kitchen Diner as private space. However, on further consideration, I decided to re-classify it as public space. This is because there are circumstances when outsiders could be guests at a meal. The main feat­ure of the Kitchen Diner is its big central large round glass table. This is primarily a dining table. However, it is equally useable as a conference table. The Conference Room is public space. For this reason, I decided to include the Conference Room in the Kitchen Dining environment, which is now re-classified as public space. In the final design, I have also taken a little licence in re-classifying other more minor acti­vity spaces in order to make small structurally-convenient compromises. The dual function of the dining table raises an important concept. An activity is simply a class of event. An event takes place at a time (or for a duration) and in a location (or space). It has a beginning, middle and end. It also has a spatial centre and periphery or perimeter. Because it is possible to separate activity events by time as well as space, we can create what we call flexible space. Flexible space is an environment (or room) that can be adapted for alternative types of activity (or even a variety of activity-types) that occur in the same space but at different times. Flexible space is adapted, for each of the different activity types it hosts, just before an activity event begins. Flexible space saves space while over-consuming time. Dedicated space over-consumes space, while saving a lot of time. Consequently, when designing a dwelling, the aim must be to make an optimal compromise between the two.